World Snooker Championship Day 16: Ronnie O'Sullivan led Ali Carter by 10-7 overnight in the World Final, after two sessions of playing. The final started in a quirky way. The cueball went off when Carter scored which Ronnie punished for such a mistake to take the opening frame. The first century in the final appeared in the second frame, 117 from The Rocket to go 2-0 up. Carter settled down in the next frame, levelling off 2-2 at mid interval with a top break of 84. 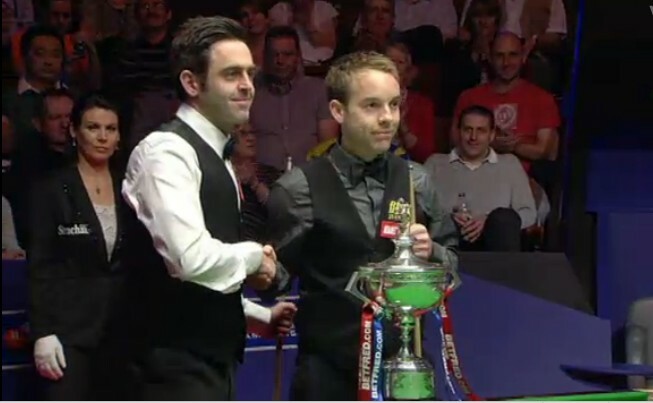 The first two frames after mid interval were shared before Ronnie made a superb 92 clearance to lead 4-3. One more frame to end the session, O'Sullivan produced total clearance of 141 to lead 5-3 before the night session started. Although Carter won the opening frame of the night session but O'Sullivan won the next three to gain three-frame advantage at mid session. Once led The Captain by 9-6, Ronnie seemed would have four-frame-cushion but The Captain got the last frame of second session with the aid of a fluke. Ronnie O'Sullivan still leads by 10-7 overnight. Ali did not play his game too well today, neither Ronnie was at his best. Perhaps Carter should go for more long pots with confidence as energy storage is crucial in long matches. I don't deny the strategy of putting more safety into his game but I think playing his own game will be the more comfortable. First player to win 18 frames would lift the trophy and top prize of 250000 pounds. Ronnie needs 8 more while Carter needs 11. Third session kicks off at 2.30pm and the final session starts at 7.30pm.